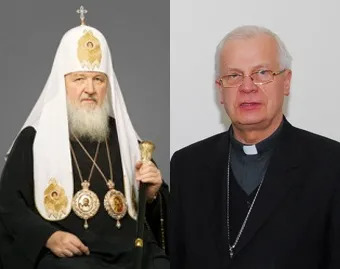 The President of the Polish Episcopal Conference, Archbishop Jozef Michalik and Kirill I, Patriarch of Moscow and All Russia will sign a joint declaration to both Polish and Russian people this Friday. The signing will take place during the first visit in Poland’s history of the head of the Russian Orthodox Church. "It is an unprecedented event," stressed the representatives of the Catholic Church in Poland and of the Russian Orthodox Church. "The purpose of this document is to resolve painful pages of Polish and Russian history," added Father Jozef Kloch, spokesman of the Polish Episcopal Conference, "the important question is to begin a dialogue that is born on the basis of the very Gospel of Christ." It is an important step that "in this phase we cannot but take," said Archbishop Michalik to Poland’s Catholic Information Agency (KAI). "This event must not be treated in political terms but as an indication of a path, a symbol and a sign of obedience to the will of Christ, an important step on the path of forgiveness," said the president of the Polish Episcopal Conference. The first important step towards Russo-Polish reconciliation was the visit of a group of monks from a Russian monastery near Ostashkov to Jasna Gora, the shrine of the Black Madonna of Czestochowa in September 2009. The delegation of the Russian Orthodox Church was led by Arkadij Gubanow, Prior of the Orthodox Monastery of Saint Nil at Stolobienskoje, region of Twer. Archbishop Stanislaw Nowak of Czestochowa and Father Izydor Matuszewski, Prior General of Pauline Fathers and Custodian of the Shrine, also gave a copy of the Icon of the Black Madonna of Czestochowa to the delegation of the Russian Orthodox Church. "This Holy Icon of the Black Madonna is a sign of our spiritual closeness, and also a symbol of Europe’s two lungs, Eastern and Western, as the Servant of God John Paul II taught," said Archbishop Nowak at the consigning of the icon. The Orthodox monks kept the copy of the image of the Madonna in the Monastery of Saint Nil at Stolobienskoje. During World War II, it was destined to a Soviet lager where more than 6,000 Polish soldiers were killed. "In this place, in our monastery, we must pray together, Russians and Poles, before the Holy Icon of the Madonna of Czestochowa, to ask for peace and to pray for all those who were killed," exhorted Arkadij Gubanow, prior of the Orthodox Monastery of Saint Nil. The signing of the declaration this Friday is seen as another step towards reconciliation between the Churches of the East.